Meet your private guide by the top of the cable car in Fira or at your Santorini hotel, and travel to the island’s caldera for your first stop of the day. A spectacular geological formation, the caldera is the volcanic remains of the original island that collapsed beneath the sea after a volcanic explosion thousands of years ago. Stand at the edge of the caldera to pose for pictures against the backdrop of the Aegean Sea, and then continue by minibus to check out another of the island’s volcanic features: a dramatic-looking black-sand beach. If weather permits, take a stroll down Perissa – the longest beach on the island – and make the most of some free time to sunbathe on the warm shores and enjoy a bite to eat for lunch, if you wish. Or, if you prefer, you can skip the beach stop. Arrange with your guide on the day. Later, travel to the peak of Profitis Ilias, Santorini’s highest mountain that stands some 2,000 feet (600 meters) above sea level. Gaze out at the island vistas surrounding you, and then follow your guide inside the ornate Greek Christian monastery perched at the mountain’s summit. Walk around the chapel, listening to the monks chanting, and savor samples of the dessert wine, honey and extra virgin olive oil that’s made on-site. After learning about winemaking in the mountains, head down into the hills to visit a typical Santorini winery and volcanic vineyard where the local assyrtiko and vinsanto varietals are produced. Sample up to four glasses of the island’s distinctive light and acidic whites while learning how wine is produced in such a dry and unforgiving island environment. 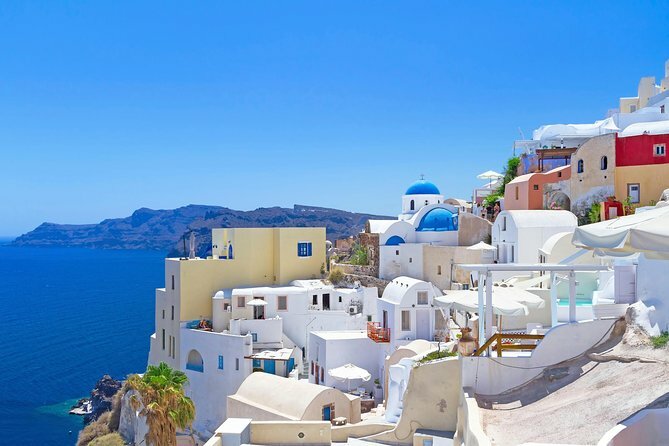 From the hills, continue to Santorini’s poster-child village of Oia, the iconic whitewashed village that’s graced many a postcard. Take a stroll around the streets with your guide to get your bearings and learn about the village history, and then enjoy some free time to sightsee and shop at leisure. After making the most of your free time, meet your guide, and then finish your day with a drop-off at the port. Worry-free Shore Excursion:We will ensure your timely return to Santorini Port for this activity. In the rare event your ship has departed, we will arrange for transportation to the next port-of-call. If your ship is delayed and you are unable to attend this activity, your money will be refunded. See our terms and conditions for full details. Meeting point for cruise passengers is top of cruise port's cable car. The guide will be holding a sheet with the Lead Passenger's name. The product will be confirmed immediately and the supplier will be sent a notification.